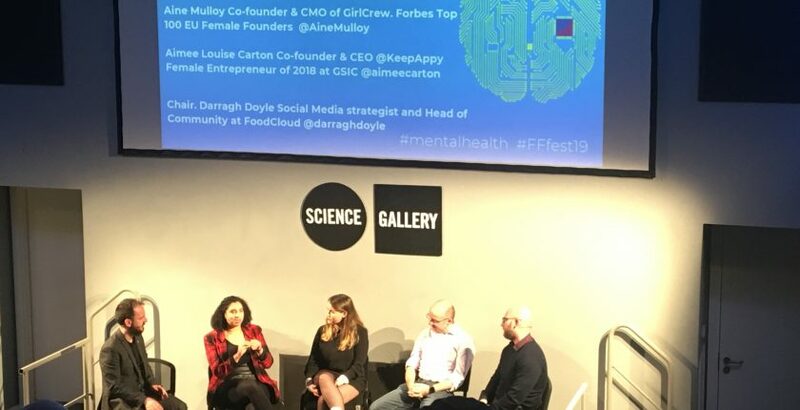 As part of their 10th annual festival 2019, FirstFortnight hosted a discussion session in the Science Gallery Dublin on the impact of technology on our mental health. The panel featured Dr Colman Noctor, Psychotherapist in St Patrick’s Adolescent MHS and Assistant Prof TCD, Gavin Doherty Assoc. Prof TCD, Co-Founder SilverCloud Health, Aine Mulloy Co-founder & CMO of GirlCrew, Forbes Top 100 Female Founders and Aimee Louise Carton Co-founder & CEO @KeepAppy Female Entrepeneur of 2018 at GSIC. The evening was chaired by Darragh Doyle Social Media Strategist and Head of Community at FoodCloud . The topic of this discussion was “Mental Health Uploaded”; the impact of technology on our mental health. The main focus was digital technology and social media, which affords instantaneous content at our disposal and a platform to express oneself. Aimee Louise Carton shared her story of living with PTSD which was a contributing factor to her being diagnosed with epilepsy. Aimee created an Instagram account for her assistance dog for connecting with people when she is unable to leave the house. “My only connection to the outside world was through social media”. This account ‘helped to see the positive in the world and technology’ as people are more willing to help when they can see a tangible illness, where there is evidence. Aimee created KeepAppy a personal wellness app “designed to empower users to take control of their mental and physical wellbeing”. She wanted to make an app that was relatable to everyone which would, not based solely on mindfulness like most other mental health apps, because in her experience mindfulness meditation can often be anxiety inducing, and she wanted to show that there are other options available. Technology and social media have their pros and cons. Today’s society may be considered a critical consumer of technology. Dr Colman Noctor explained that the impact of technology is related to the user’s engagement: “it’s not bad technology, it’s bad use of technology…” Dr Noctor went on to explain that technology carries the risk of encouraging narcissism, for example doing charitable gestures for ‘likes’, for the share value and not the act itself ; we are conscious of our behaviour and construct ourselves online. The group raised the issue that ‘we’ve never before questioned the technology we use’ however, we are starting to ask it now. For example target ads and how they determine how we feel or how we should react to something. This highlights technology’s ability to pre-empt how we live our life and therefore affects our mental health. Gavin Doherty who works in the School of Computer Science and Statistics spoke about the use of mobile phones and technology’s intervention in healthcare. Mobile phone apps offer the opportunity to fill some of the gaps in services left by lack of resources. Technology can help people to engage in treatment. It was also noted that technology is not limited to just social media and can often provide peace of mind, for example when caring for the elderly or as a comfort to somebody with autism. One of the downsides of technology is it’s replacement of human connection. For example, a person will choose to email rather than telephone someone. Tracking apps and calorie counting apps can also encourage obsessive behaviours. “it’s something you have to be aware of and consciously cut down how much time you spend on it”. Overall the panel agreed that the uses of technology can have both positive and negative impacts on a person’s wellbeing. The panel addressed the negative impact of fake news and the language used on social media (fonts, emoji’s and overuse of dramatic phrases). This can be damaging to individuals who have mental illness as it can feed into the stigma surrounding mental illness. The panel agreed it would be beneficial to switch off and take a break if someone felt their social media was impacting their mental health negatively. It is often good to look beyond social media and to step away from this need to maintain an online ‘perfect image’ which social media often falsely portrays. Aine Mulloy described social media as a ‘double-edged sword’ and stated the importance of being mindful and present in the moment rather than capturing everything on her phone for the sake of likes on social media. The important point of note was the need to find a balance. Technology affords many solutions and convenience but it is ultimately up to the user to practice restraint and limit use so that technology does not become damaging to your mental and physical health. One suggestion was to ban technology at the dinner table and normalise this with your children/family. Technology may be compared to a relationship, like the relationship we have with food. Donuts are not good for you but you like it and it is a treat, which may be enjoyed every now and then. It is not a necessity to your survival and would become very harmful if that was all we consumed as a diet. 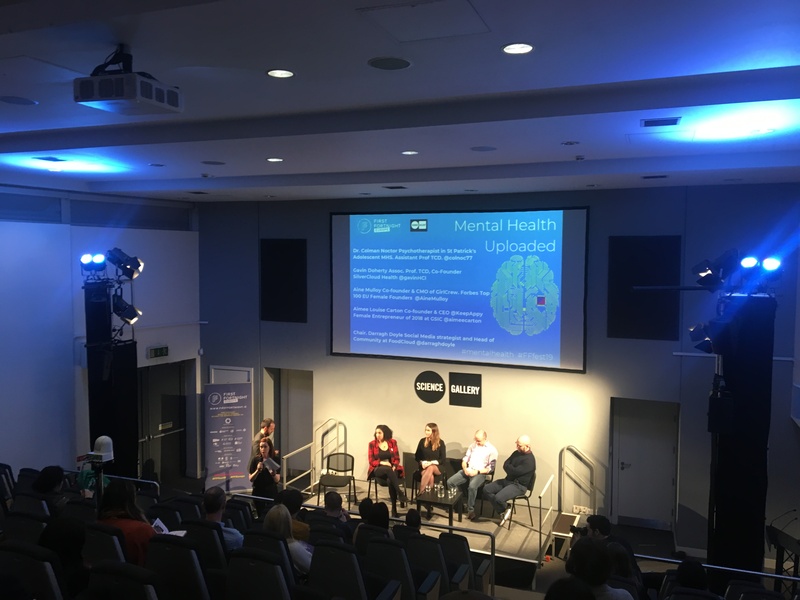 The panel agreed that mental health is the same as your physical health, with different levels of severity, some of which may require more than two sessions with a professional. The speed of technology has also influenced the idea that recovery should be instantaneous. Social media and digital technology have created a sense of impatience and has created a disconnect between our expectations and realities. It could be argued that this has been driven by this comparative society we live in (likes on Instagram and number of followers on twitter). The panel expressed how First fortnight is an excellent dialogue which allows us to see how messy mental health can be and that it is OK to search and find an option that suits you.